This week in the journal Science, Los Alamos National Laboratory researchers reveal a new solution-based hot-casting technique that allows growth of highly efficient and reproducible solar cells from large-area perovskite crystals. "These perovskite crystals offer promising routes for developing low-cost, solar-based, clean global energy solutions for the future," said Aditya Mohite, the Los Alamos scientist leading the project. 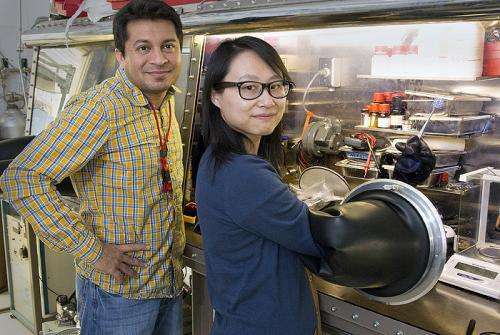 State-of-the-art photovoltaics using high-purity, large-area, wafer-scale single-crystalline semiconductors grown by sophisticated, high temperature crystal-growth processes are seen as the future of efficient solar technology. Solar cells composed of organic-inorganic perovskites offer efficiencies approaching that of silicon, but they have been plagued with some important deficiencies limiting their commercial viability. It is this failure that the Los Alamos technique successfully corrects. The researchers fabricated planar solar cells from pervoskite materials with large crystalline grains that had efficiencies approaching 18%, among the highest reported in the field of perovskite-based light-to-energy conversion devices. The cells demonstrate little cell-to-cell variability, resulting in devices showing hysteresis-free photovoltaic response, which had been a fundamental bottleneck for stable operation of perovskite devices. "Characterization and modeling attribute the improved performance to reduced bulk defects and improved charge-carrier mobility in large-grain pervoskite materials," said Mohite, "and we've demonstrated that the crystalline quality is on par with that observed for high-quality semiconductors like silicon and gallium arsenides." The researchers anticipate that their crystal growth technique will lead the field towards synthesis of wafer-scale crystalline perovskites necessary for the fabrication of high-efficiency solar-cells and be applicable to several other material systems plagued by polydispersity, defects and grain boundary recombination in solution-processed thin-films. More information: Science magazine (issue of Jan. 30, 2015, Vol. 347, #6221): "High Efficiency Solution-Processed Perovskite Solar Cells with Millimeter-Scale Grains."